Caddy Fold-N-Drive Scooter heaviest Piece only 28 lbs. 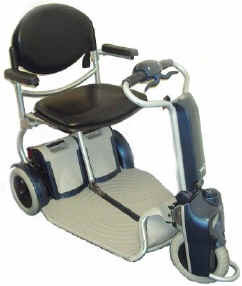 Caddy attractively designed versatile mobilizer with the added features that it FOLDS UP in seconds. This folding design allows you to stow away the Caddy either vertically or horizontally in closets or in trunks of small cars. In seconds without any tools and from a standing position you can also disassemble the Caddy into smaller lighter parts for easier transportation. If you are looking for a powerful, full size and completely portable electric scooter, the Caddy is the scooter for you. Driver-friendly Plug-in / Plug-out battery connection - just plug 'em in and off you go! Front Tire Size: 2" x 10"
Rear Tire Size: 2" x 10"